Upon reaching Sundarijal, the first thing I noticed was the sound of a roaring waterfall that subsided all other sounds. While my friends were busy shopping for some essentials, I was staring straight into the wonderfully clean and shining stream of water. 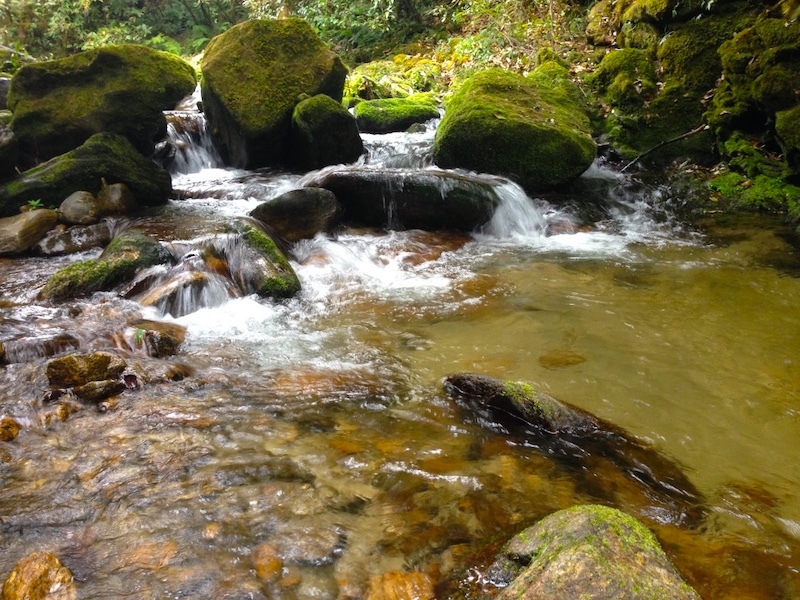 The immense energy of the waterfall had brought a sense of calmness in me. With this calmness as my walking stick and a ticket as my entry into the national park, the walking had finally begun. A steep uphill for the first 15 minutes passed through a village that showed glimpses of the people and culture we were about to experience in our path. A short stop at a showering waterfall refreshed me up for the walk ahead. The trees were wet, the ground was moist, the birds were chirping and I was happy. I noticed a lot of local people along the way with the majority of them being children on their way to school. After about an hour or so, we stopped for a light lunch and had a chat with a local resident on issues that are normally discussed during lunches. I was surprised by the level of intelligence this old man had regarding issues that educated people are having problems dealing with. After we had lunch and said our goodbyes, we continued our journey through sections of forests and villages beautifully spaced to accommodate both beauty of nature and the need for human existence. Short after passing the last house, we would encounter before Chisapani, we took one last stop at a wonderfully green meadow with a balcony view of the mountains. We stayed there for about an hour and reluctantly moved towards our destination. The forests grew thicker and darker, but yet more beautiful. The shades of colors were so perfectly displayed that it felt like I was in an art gallery designed by nature. The beauty was overwhelming. A couple of hours later, we reached Chisapani. It appeared that the right time to reach Chisapani is around or before the sunset and we had accidentally managed to do so. I could not contain myself with what I was witnessing. The fading sun and the clear mountains had a relationship more beautiful than any other relationship I could ever imagine. The blue skies added to the beauty. I sat in awe for most of that evening. Just as the lights were fading, my disappointment grew as the magic too, was ending; but a blanket of stars took my attention to a whole new level. Staring into space made me realize how infinitely small part of a gigantic universe I am, and yet I could experience the entire universe as my point of view. A warm fire, good food, and a warm bed made sure that the day ended beautifully and all that was remaining was the possibility of an even better tomorrow. The second day started with a cool breeze that managed to slip through what I thought was a tightly closed window. It was 4:30 a.m. I got up, freshened up and by 4:45 I was up on the terrace. It was cold enough to put on every single piece of clothing that I brought for the trip. The wait had begun. With a cigarette in my hand and Norah Jones by my side, I sat patiently looking at the wonderfully laid mountains. The transition of colors as light overpowered darkness made me feel like I was in a painting. At about 6 o’clock, the sun finally emerged and the mountains and I shared a smile. Soon after, my team got together, had our breakfasts and at about 9 o’clock we started our hike towards Nagarkot. The trail and vegetation were similar to the day before. But to our surprise, after about 30 minutes of walking, we came across a pristine little pond surrounded by wet and luscious grasslands and forest. Sitting by the lake for an hour just looking at the undisturbed reflection of mountains on the pond while waiting for any involvement of wildlife around us was a wonderfully spent hour. Reluctantly, we had to move again. Soon after, the forests started getting denser and the trails overcrowded with vegetation. Seeing tracks of various life forms other than humans brought a sense of fear within me. Although I felt safe, I also knew nature can be cruel at times and so decided to walked together in a group rather than walking alone at our own pace like the previous day. The rest of the day went similar to the day before but a bit longer. It was already dark by the time we reached Nagarkot, although we were guilty of taking too many stops in the forests. We were tired and hungry as we didn’t stop for lunch and ate whatever we had left in our backpacks. I didn’t have the same energy and enthusiasm as the day before. A well-cooked meal, a couple of glasses of local wine and 15-20 minutes of admiring the moon was all I could muster up on that night (I went to Nagarkot a couple of weeks later and stayed up all night). It was also probably one of the best sleep I have ever had. The third day had a foggy beginning. I woke up at around six and noticed we were almost in a cloud. Thankfully, the wind was on our side and soon after, clarity was restored. But to our dismay, the sun rose up before the fog had cleared. We had missed one of the most appreciated sunrises but were still enthusiastic about what lies ahead. After two days of walking, it had finally started to feel like a normal day and as if it were a part of me more than what I had thought was a part me for a long time. I had almost forgotten what it was like to live in a city and I loved this more than anything else in the entire universe. From this day onwards, trekking became an annual event and hiking became a monthly event in my life. The trail started only after walking for an hour or so on roadways for vehicles. Before embarking on the trail further, we stopped by a local tea shop which had an overview of the mountains. Realizing that this is the last day of staring into the eyes of nature, we decided to stop wherever one finds beauty to admire. Naturally, we stopped a lot. A conversation with the local people brought about laughter, which was the only ingredient missing from a wonderfully cooked meal. The journey continued. It seemed to us that this section of the trail was much less traveled by as there were times when we had to find our own way, getting lost from time to time. But the loneliness in the trail had a mystery of its own. It brought me much closer to nature and made me realize how I too, am a part of nature and can never be separate from it. At about six, we reached a hilltop which was bright red. The sun was setting. The clouds were the covers. The majesty of the color is something I do not have words for. We stood there until the sun went down. 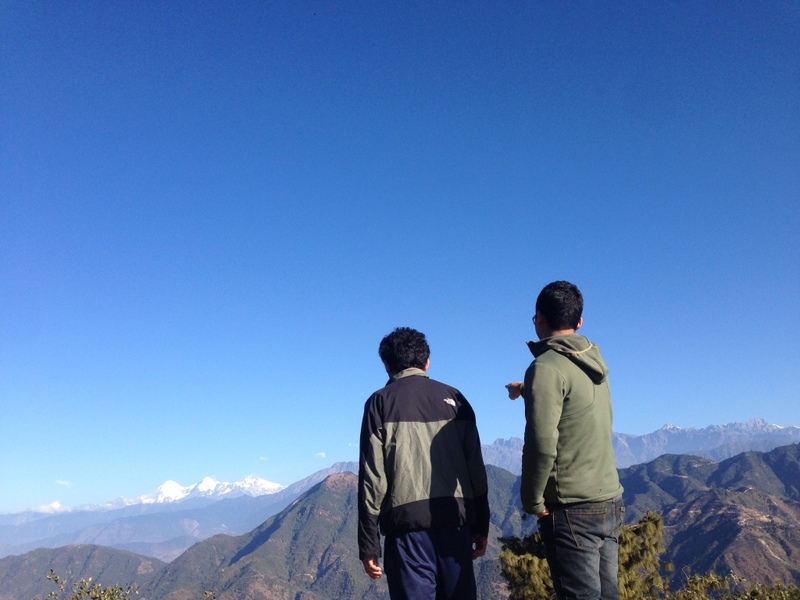 We took in one last glimpse at the skies and continued towards our destination which was Dhulikhel. An hour walk towards the brightly lit city of Dhulikhel was the last hour of our route. The bus ride back home had mixed emotions. Society and nature were two choices that I could. take. Then it dawned, if nature and society can coexist, this turmoil of emotions in me would subside. This is something I have been thinking of every day and hopefully, everyone will also see it someday. This article is a collage of my numerous experiences of Chisapani, Nagarkot, Dhulikhel and what lies in between. You would be the luckiest if you can experience every possible beauty and mystery that is available in nature in one trip, but I was not able to. It is only through numerous trips to these places, numerous meetings with people, different groups every time and even an occasional solo trip that I have been able to form this collage and It is only through your experience and your encounters that you can create your own. Your own point of view.